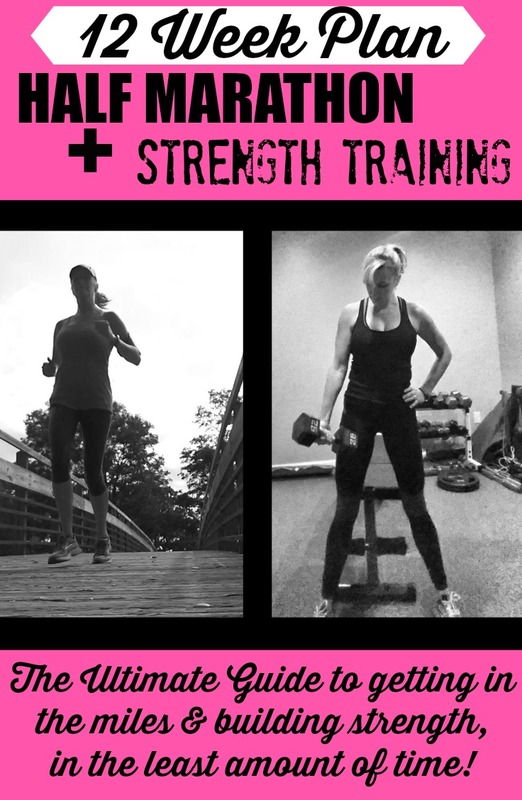 Half Marathon + Strength Training…it can be done! I love a good training plan, but sometimes I need to make my own in order to accomplish the goals I am trying to reach! This time around…I’ve set my sights on a half marathon. BUT…the one thing that’s missing from most training plans is STRENGTH training! I LOVE to lift, because I love how I feel, and how my body looks with lean muscle mass. Too much running, and not enough lifting, and my legs turn into little toothpicks. I also love that lifting weights turns my body into a calorie-torching machine! Ya, I burn some calories when I run. But if that’s ALL I do, my body adapts and actually starts holding on to extra calories to fuel those long runs. When I lift, I get the benefit of the ‘after-burn’! I keep burning calories even after my workout is done! BOOM! So…with my half marathon about 2 months away, I’ve been working with a schedule that allows me to do both! I always start with the basic Hal Higdon plan, and then modify in order to fit in the strength training that I want to do each week! If you’re interested…I thought I’d share! To download this FREE 12 week plan, just provide the information below, and you’ll receive an email with directions to download. 🙂 Happy running…and LIFTING! Previous PostPrevious April Fools Day Dinner Fake-Out! Next PostNext How to get the stink out of your workout clothes!